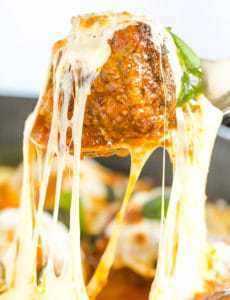 An easy skillet meal - awesome meatballs simmered in a tomato sauce and topped with lots of fresh mozzarella. Make the Meatballs: In a large bowl, combine all ingredients and mix with your hands until thoroughly combined. Shape into 2-inch meatballs. Heat the olive oil in a large ovenproof skillet over medium-high heat. Add the meatballs and cook, turning frequently, until browned all over, about 10 minutes. Use a slotted spoon to remove the meatballs to a plate. Reduce the heat to medium. Add the onion and red pepper flakes, and cook, stirring occasionally, until the onion is tender, about 4 minutes. Add the tomatoes and basil leaves; reduce the heat to maintain a simmer and cook, stirring frequently, until the sauce is slightly thickened, about 8 minutes. Return the meatballs (and any accumulated juices) to the skillet, cover and simmer, turning once, until the meatballs are cooked through, about 20 minutes. Preheat the broiler. Arrange the mozzarella slices on top of the meatballs. Broil until the mozzarella is melted, 2 to 3 minutes. Garnish with additional fresh basil, if desired. Serve warm.